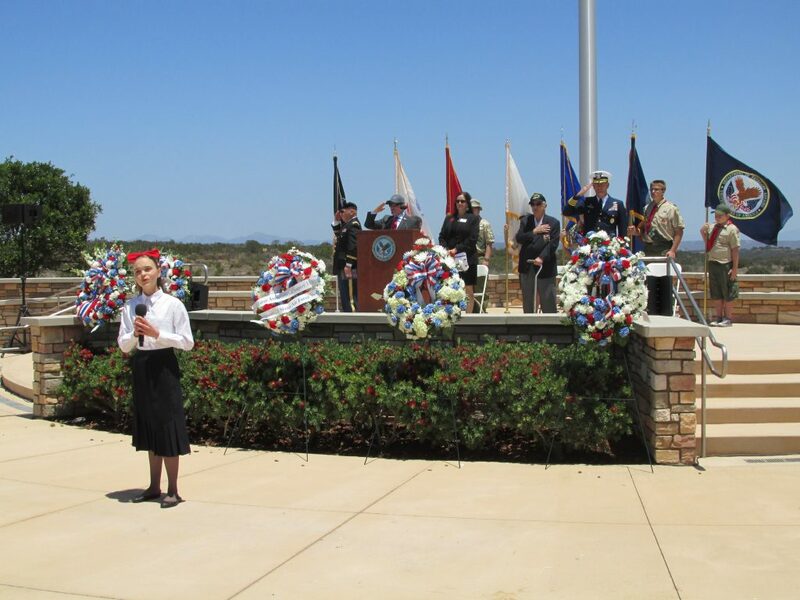 Ninth-grader Siena Lorraine Haustein of Carlsbad sang the National Anthem at the beginning of the Veterans Memorial Service. 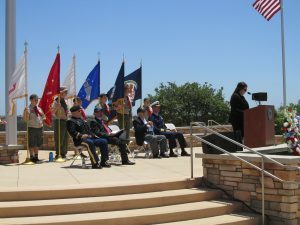 It was a special day of remembrance at Miramar National Cemetery, 27 May, as veterans and their families, active duty members, and the public gathered to pay their respects to those who lie at rest in the “Garden of Heroes”. 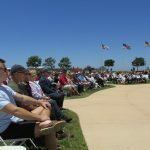 The sunny, breezy day brought out some 500 to participate in the Veterans Memorial Service, the seventh annual commemoration sponsored by the Miramar National Cemetery Support Foundation. Speakers noted that this year marks the 150th anniversary of Memorial Day, and the 100th anniversary of the end of World War I. Foundation President & CEO Cathy Fiorelli welcomed the audience, and asked them to remember the individuals who are buried at Miramar National Cemetery. Army Sergeant Charles Schroeter, a German immigrant, and veteran of the Civil War and the Indian Wars. Schroeter is the only Medal of Honor recipient buried at Miramar National Cemetery. Capt. 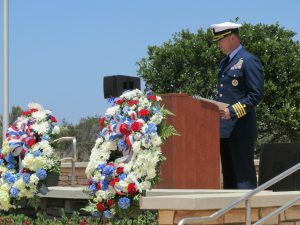 Joseph R. Buzzella, Jr., commander of the Coast Guard Southwest Region and Captain of the Port of San Diego, was the ceremony’s featured speaker. He is responsible for operations ensuring maritime safety, security, and environmental protection from the US-Mexican border north to Dana Point, and inland to include Lakes Havasu, Meade, Mohave, Powell, and the Colorado River. Coast Guard Capt. Joseph R. Buzzella, Jr., recalled the sacrifice of the servicemen and servicewomen who protect and defend our liberty, and our way of life. Buzzella told the story of Coast Guardsman Douglas A. Monro, 22, a first-class signalman, who led the evacuation of a battalion of Marines that came under heavy enemy fire at Guadalcanal in September 1942. With most of the Marines embarked on Monro’s group of boats, he placed his own boat in the line of fire between the enemy and the remaining Marines, allowing them to evacuate safely. In doing so, Monro was fatally wounded. For his “extraordinary heroism and conspicuous gallantry in action”, Monro, a native of Cle Elum, Wash., was posthumously awarded the Medal of Honor – the only Coast Guardsman to be so honored. The Army National Guard’s 40th Infantry Division Band performed patriotic music, and ninth-grader Siena Lorraine Haustein of Carlsbad, daughter of Wendy Wutzke and Scott Haustein, sang the National Anthem. Also participating in the service were Chaplain (Colonel) Stephen E. Forsyth, Jr., who delivered the Invocation and Benediction. Forsyth is the Senior Army Chaplain for the California Army National Guard, and the Senior Pastor at the El Cajon Wesleyan Church. Bugler David Powell performed “Taps”, and Bagpiper John Forrest played “Amazing Grace”. The San Diego unit of Young Marines, local Boy Scouts and Sea Scouts troops assisted visitors during the ceremony.